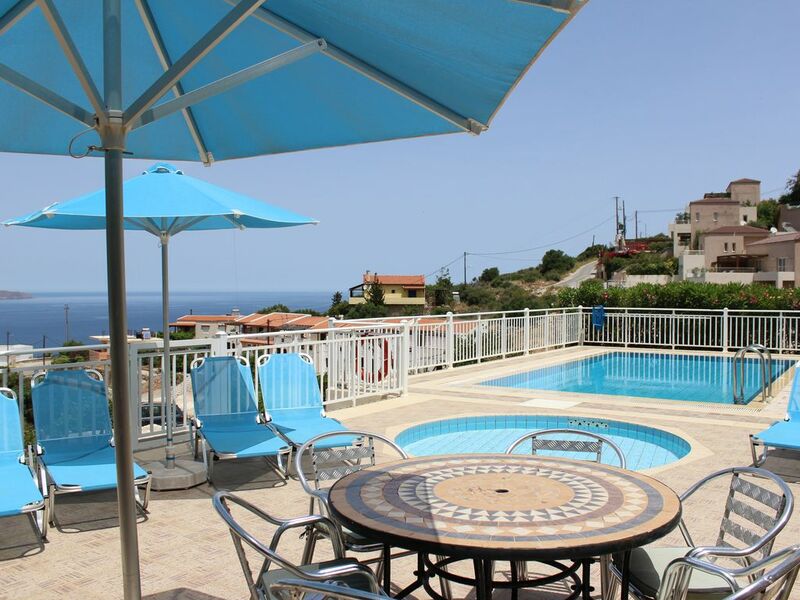 Beautifully furnished and equipped, the villa is nestled in the hillside, will provide you with everything you will need for a fabulous home from home, luxury holiday. WIFI Internet connection, Leather sofas (1 sofa bed), flatscreen TV with satellite, DVD, Hifi, dishwasher, washing machine, fridge/freezer, coffee maker, juicer, toaster, kettle. 3 Bedrooms and bathroom on ground floor and living area and wetroom on 1st floor taking advantage of spectacular views. Private pool & separate shallow children's pool with ample outside space and seating, including fabulous BBQ. Superb Lighting. Each bedroom and living area has french doors to balconies with mountain & sea views. Sleeps 8 plus Z Bed, cot, stairgate,babyseat. Weekly linen change. Beach towels, hairdryer etc provided. Full air conditioning in all rooms.Villa is positioned on large 1000m2 plot with gardens, pool terrace and private gated drive with ample parking. Child friendly, with security gates from terraces, so restricting access to pools. PEACE OF MIND & EXCELLENT VALUE FOR MONEY: Our property is fully EOT licenced. The Greek National Tourist Organisation. It is a legal requirement in Greece to have an EOT licence which ensures that properties reach high standards, have appropriate insurance, comply with Health & Safety and are strictly regulated to protect guests. Eating out is cheap and there are plenty of excellent bars and restaurants locally with some open all year round. You can't beat a Greek Salad accompanied by a cold glass of Mythos beer. Greek Cuisine is superb, so try the local dishes. Explore the island it has many delights. THE DISTRICT OF APOKORONAS: The district of Apokoronas in the north eastern corner of the prefecture of Chania and at the foot of the greenest regions of Crete contains some interesting sights such as lake Kournas, the island's only freshwater lake, picturesque villages and small beach resorts such as Georgioupolis, a sleepy little fishing village with village square, Kalives, a large village with nice sandy beach and Almyrida with its shallow waters ideal for families. Vamos is the capital village with restored old stone buildings. POPULATION OF CRETE: Crete has a total population of approximately 624,000 inhabitants. Heraklion 120,000, Chania 60,000, Rethymnon 24,000. The fertile land is perfect for agriculture and produces oranges, avocados and bananas as well as succulent tomatoes and cucumbers, which make those Greek Salads unbeatable. It's main export is Olive Oil. Fresh water, scarce on other islands is plentiful on Crete whether for a cool drink or shower. Washing Machine is installed in the main bathroom on the ground floor. Wetroom with shower, basin and Toilet is located on the 1st floor servicing persons using the sofa bed. Open plan light & airy living area on the first floor. Two large sets of french doors leading out on to balcony with outside dining table and chairs with breathtaking views of Souda Bay. Looking down on to the gardens & pool terrace with the two swimming pools, one 1.4m deep one shallow pool for the children. Living area fully equiped with feature, working fireplace, Leather Sofas, Flatscreen TV with DVD and Hi Fi, coffee table, TV unit, occasional table with lamps, dining table and chairs and fully equipped kitchen. Feature stained glass window over the stairs, providing a fantastic array of colours as the sun shines through. There are two additional balconies leading from the living area, one shaded for most of the day, ideal for reading and the other taking advantage of the morning and afternoon sun. We have stayed here for four years in a row and absolutely love it. The villa is spacious and beautiful and the views are fabulous. We really enjoy the area...a bit away from the crowds but close to great food and beaches. Villa totally lived up to the description and more. Very clean and well maintained and what a view! Was very impressed that beach towels were provided too! Really can't fault it! Have already recommended to friends. We spent 1 week here as 2 families. The villa is well equipped, clean and well maintained. Julia has provided an excellent information folder which we used a lot. Plaka a 20 minute walk has some nice restaurants in the square. Complimentary starters, fruit and Raki. The Italian on the right as you go into Plaka is excellent. Kalyves is lovely with good restaurants. Car hire recommended to get around. Excellent booking process and quick response to queries from Julia the owner. Missing the view already. The villa was even better than the photos suggested - bright, airy, modern and clean. It was well equipped with efficient air conditioning, which was great as it was over 30C every day. The village was picturesque with a good shop and friendly taverna. We hope to return some day as we had a great week. We, a family of five and two grandparents, really enjoyed the house and our stay in Crete. The house has all the facilities needed and particularly the view over the sea will stick in our mind. Crete was just as pleasant an experience as expected and we had a very good balance between relaxation at the pools and beach and visiting cities and the water park. Our party of three adults and three children enjoyed a wonderful week at this luxurious villa. Julia and John have created a 'home from home' feeling, nothing was overlooked, down to the last detail, even beach towels are provided. The villa was immaculately clean when we arrived, Julia's information was detailed and helpful. Apart from the prime location overlooking Souda Bay from the terraces and swimming pool area, the fittings and furnishings are tasteful and of superior quality. The pool area is well equipped with six sun loungers and two parasols, a very nice BBQ, table and chairs with cushions. The small paddling pool is ideal for smaller children and plenty of beach and water toys can be found in a box on the patio. All in all we felt the owners share very generously all their facilities and we can not recommend the villa highly enough. Crete is the largest of the Greek islands, 260km long by 15-60km wide. Crete has 325 days of sunshine each year with a perfect mediterranean climate. Western Crete is the greenest and most fertile regions of the island. Villa Bougainvillea is in a quiet location with stunning views to Souda Bay and the White Mountains, close to Plaka and Kokkino Chorio villages and just 5 minutes from Almyrida Beach with all its bars and restaurants. Also there is a taxi company based in Almyrida to take you to Chania with it's famous Ventian Harbour or Rethymnon with it's smaller harbour, both just 20-30 minutes away. Beautiful views of Souda Bay and the Lefka Ori Mountains with it's famous gorges such as the Samaria Gorge. Surrounded by traditional pretty Greek villages like Vamos, fantastic walks. The working fishing town of Kalives is just 10 minutes away for banks, supermarkets, shops, bars and restaurants with a beautiful beach and harbour. The area is famous for it's fabulous sunsets. Golf: There is a golf course near Heraklion.